It does not matter to what lengths one tries to keep carpets clean, eventually a professional carpet cleaning will be necessary. If any part of a home has carpets, be it wall-to-wall carpets or rugs, a visit from a professional carpet-cleaning service is recommended every few months. This is the only way to provide a deep cleaning and maintain the great look and soft feel of carpet throughout the year. High Quality Carpet Cleaning is a team of carpet, rug and upholstery experts that service the greater New Jersey area. As the region’s most respected cleaning company, customers know where to go for top quality services and super unbeatable prices. Everyone who has carpets and rugs need regular cleaning from professionals. This is especially true for homes with children and pets or high traffic businesses. High Quality Carpet Cleaning is the area’s most trusted cleaning company, with the highest certifications in cleaning and restoration services. This means that rugs, carpets, upholstery and draperies get the expert attention that they deserve by restoring the color, vitality and cleanliness that they once possessed. 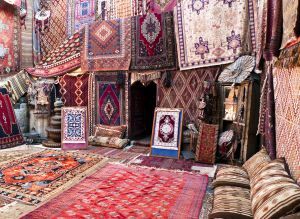 Highly trained experts will arrive on the scene and perform a thorough inspection of rugs and carpets and utilize techniques that ensure the best clean every time. Without professional cleaning, carpets, rugs and delicate upholstery soon lose their luster and get choked with dirt and grime. Trying to clean them with a regular vacuum is impossible. Only by contacting a company staffed with technicians possessing specialized training and powerful equipment can you fix the situation. Call on the experts and have these materials restored within hours. Professionals do this by using powerful and efficient steam cleaning methods that deeply penetrate plush and tightly woven fibers. With a combination of high temperature extraction and special cleaning agents, carpets and rugs are freed from dirt, dander and bacteria quickly and efficiently. Many types of area rugs are made from a delicate array of natural and blended fibers that need specialized treatment. Attacking dirt with a mere vacuum or store-bought products is not the answer and likely to do more harm than good. These methods are ineffective, as vacuum brushes only scrape the tops of fibers and chemicals can wash away natural colors and dyes. High Quality Carpet Cleaning knows how to professionally clean delicate carpets and rugs, without harming their expensive beauty. They understand that customers want a clean floor, but not at the expense of damaging important investments. As the most respected carpet cleaning company, High Quality Carpet Cleaning customers always expect the best. This means that rugs, carpets, upholstery and draperies get expert cleaning every time. Do not trust expensive carpets and rugs to other companies that promise the world but only provide lackluster results. Rugs and carpets are an important investment, so it only makes sense to trust them to professionals that take their business seriously. Find out more about professional rug and carpet cleaning by contacting with the professionals at High Quality Carpet Cleaning today!